We offer a range of traditional Indian food. We cook on an open flame grill and use only 100% Pure Virgin Olive Oil. Choose from a selection of healthy dishes and you’ll be surprised that you don’t have to compromise on taste.The best Asian cuisine and award winning restaurant quality food available for take out or sit in. We provide high quality and health food that you have never been experienced. 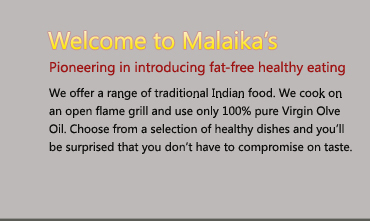 That's why Maliaka's Grill is the best in town. Cooks most foods on an open-flamed grill - a healthier and tastier alternative to frying. Does not use ghee/butter in any products which is high in saturated fat, but uses 100% pure virgin olive oil. Uses real chicken breast, not processed fillets. Uses 100% cheese on pizzas which are freshly prepared. Potato wedges are oven baked and not deep fried. Serves a healthy, low fat, fruit chaat. Offers bottled water and fruit juices as an alternative to fizzy drinks. Serves low fat dressings and sauces which are all prepared in-house. Provides a selection of vegetarian and fish dishes in its choice of curries, wraps and pizzas.